Tokyo, Japan – October 1, 2018. RT Corporation, a manufacturing company focused on providing solutions in the areas of robotics and artificial intelligence, is excited to announce that it has unveiled a humanoid, dual arm collaborative robot prototype able to plate food on bento lunch trays side-by-side with human coworkers. The prototype, as compact as 130-150cm (4’3”-4’11”) in height, overcomes the challenges of food plating and makes the safe collaboration between robots and humans a reality in the bento (meal) production lines. 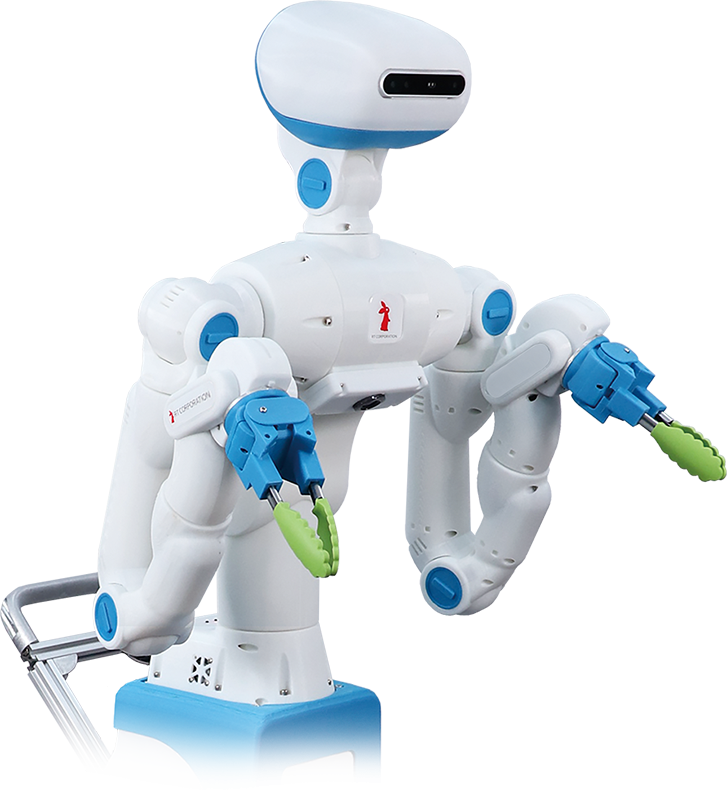 “We have developed the prototype based on one of our core products, the upper-body humanoid collaborative robot Sciurus 17. The prototype is equipped, in addition to a camera that recognizes the irregular shape of the food items piled in the food container, with a plate-up function that allows the robot to pick one item and arrange it in the meal tray. To the best of our knowledge, our patent-pending plate-up function is the first-ever plate-up technology in the food industry”, said Yuki Nakagawa, CEO of RT Corporation. The prototype uses Google’s TensorFlow as its deep learning framework. Its motion smoothness, along with its neat and stylish design ensure safety in the work environment. Wheeled and easy to carry around, it can be readily adjusted to fit the bento production line where three or four different types of bento boxes are produced every hour. “We wanted to provide a state-of-the-art technology for the food industry that suffers from severe shortage of workers,” Nakagawa also said. “We have attracted interest from top-notch system integrators who have been cooperating with us to implement prototype robots in bento factories. We will be conducting demonstration experiments from 2018 to 2019, announcing a mass production plan and starting pre-sales within 2019. Everything is set to make it commercially available by 2020”. Based in Tokyo, Japan, RT Corporation is focused on delivering world-class innovation by researching, developing, manufacturing, and selling robots with a wide range of applications across diverse industries. RT Corporation is committed to developing human-friendly robots by improving their functions, capabilities, design, speed, synergy and interaction.